scrumdilly-do! 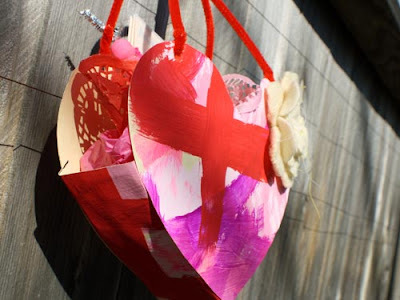 : Valentine's Day: Heart Shaped "buckets"
This nifty heart-shaped carry-all was made from one painted manila folder. A ten pack can often be found at your local dollar store and makes for a very happy and budget friendly project for a group or family. 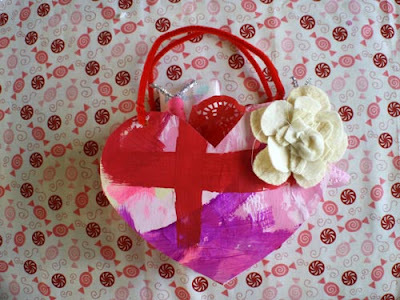 You can also repurpose some of your kiddos already made art if you wish. What happier way to transport your homemade valentines? Set up your mess friendly work area and have your kiddo paint one side of their folder however they please. Set aside to dry. When dry, flip over and paint the other side. One fun way to do this is to dribble paint on top of folder, place a sheet of wax paper over paint and smoosh, smoosh, smoosh away. Allow to dry. While paint is drying, grab your scrap sheet of paper and assess how big you want the container to be. The heart here is about 8" across and 6" tall. 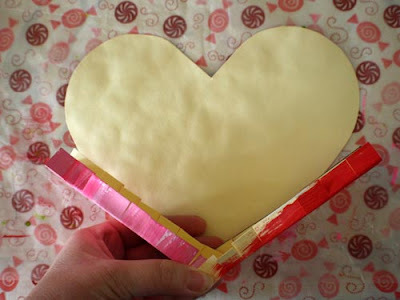 Fold sheet in half and draw your half a heart. With scissors, have your kiddo cut along the line you drew to create their heart. Once the paint is dry, refold folder in half with paint facing in and set back on work surface. On one side of your folder, measure up from the bottom, 5" and in from one edge 3". Use your ruler to draw your lines at your measured points. Make sure the bottom fold of your folder is utilized. Cut out rectangle with scissors. 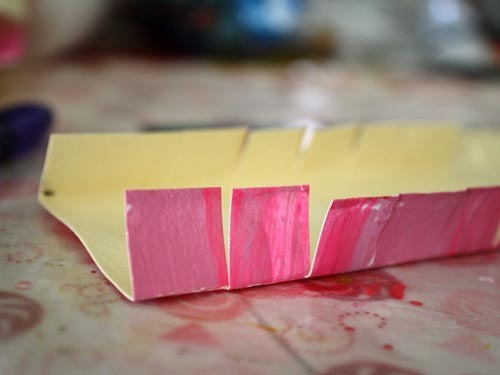 Including the fold, you will now have a long strip of painted paper. Please make sure to let your kiddo do the measuring and cutting if they are capable and wish to do so. Rulers are kinda fun to play with and allow for a nifty talk on measurements, etc. If only I understood the metric system. Gotta learn that, I really do. Next, measure in from each length 1/2" and fold edges in along your marks. Make a number of small incisions from edge to crease about every quarter inch or so. Begin by snipping along the center fold and work your way out. Set aside. 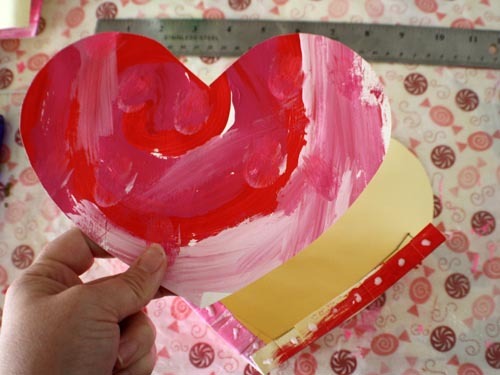 Place your heart pattern atop the remaining bits of the painted folder and trace. Once you have your heart traced, carefully use scissors to cut it out. You should now have two cut hearts all paint splattered and happy. Grab the glue and squeeze one dot onto each flap on one side of the long strip you cut out. Don't use too much glue otherwise it will get sloppy and your paper will take too long to stick. Challenge your kiddo to making tiny dabs of glue. With one heart shape paint side down on your work surface, carefully line up the edges of your glue happy strip along the edges of the heart. Use the center fold of the strip at the bottom point of the heart to line everything up and keep your sides even. This is where things get sticky but take your time and slide and position the cut strip to the contours of the heart. Hold in place for just a moment or two then set aside to dry. Repeat with other side once the first side is dry. Making the cuts in the rectangle allows the whole shebang to curve where you need it to. Set aside to dry. Now that your heart container is dry, punch through each side at the top once on the left and once on the right. Thread a pipe cleaner front to back just a smidge and twist to anchor. Loop the other end through the other hole on the same side and repeat with your second pipe cleaner on your other side. Be careful, pipe cleaners can be pokey! Use ribbon or yarn instead if you wish, anchor each end to a bead to keep from slipping out of the holes. Decorate the outside more with stickers and extra bits o love. Fill up your happy heart-shaped bucket with handmade valentines, snacks and sweets. Happy delivering! *you will probably have some left over painted folder on your hands, why not cut out as many hearts as you can and stitch them together for a happy valentine garland? I turned my extra scraps into clouds. cute idea!! I especially love the finger painting part!! Really cute! I could see doing this for a Spring Mother's day present with flowers inside since Valentine's day is over!